Sixteen retailers enter this tournament and only one will finish without a loss. Our selection committee has chosen what they believe to be the top 16 stores, sites, and brands of the affordable men’s style world. But unlike that other bracket based tournament which happens around this time of year, you have a direct say as to who moves on, and who gets sent packing. Starting Tuesday March 15th, a new head to head match-up will be open for your votes. You pick which store you prefer, and click to leave your vote. The store with the most votes at the end of the day moves on to the next round. The comments section will also be open for you to make a case and debate the merits of each side. (Click above for a slightly larger full sized bracket.) Let the pre-tournament kerfuffle begin. Did the committee get the seedings right? Which “bubble” stores got unfairly left out? Got any predictions? It all goes in the comments section below. I think J. Crew and Gap will go far into the contest. Perhaps even into the finals. What I’m really curious about is the consensus is for Indochino. I know I’ll be ordering my suit within the next month. I really have been impressed by Land’s End and their customer service. The clothes are generally OK, but I keep coming back for the way they treat every customer. I’d like to see Brooks Brothers make it at least to the second round, as I’m a huge fan of their slim-fit polos and dress shirts. I don’t expect them to go further than that, though: I own Aldens and a Brooks Brothers suit, and while the quality is awesome, many of the other stores in the tourney offer a better price/value ratio. Even though it’s a bit of a “dirty word” in online men’s clothing retailers, I would’ve been pleasantly surprised to see Paul Fredrick in the running. The quality of their stuff isn’t nearly as bad as public perception. Lands End Canvas is the sleeper. Crazy sales, clothes fit nice and slim, and customer service is the best of any of them. Returns even on the most slashed discounts, unlike some of the others. I agree with the Lands End Sleeper. I ordered some oxford button downs from them online, and not only do they fit great, but they sent me a hand written thank you note. Barely any people write hand written thank you notes, let alone retail stores. Topman is not making it past the first round. No way. LAC, Amazon, Target and Zappos(?) to the final 4. The top half of Region 1 is stacked. Macy’s, Target, and Indochino would all be in my Final Four if the seeding allowed, and Brooks Brothers would definitely be making it a couple round against any other competition. Great idea! Let the games begin! LEC, Goodwill, Macy’s, J. Crew…this accounts for a huge chunk of my wardrobe. Recently visited a Topman for the first time, and I’ll probably be voting for them at least once. Haha nice. That would be quite the upset. J.Crew should make it to the finals, quality and selection–wise, but I know they will get some flak for cost. I always have better luck at J.Crew than B.R, despite BR’s frequent sales. I would have preferred ASOS to replace Endless but that’s being picky. The most difficult choice will be between BR & Zappos. I don’t know whether to choose BR based on the products they offer or Zappos based on the fact that they always do something unexpected (e.g. free upgrade to overnight shipping) to put a smile on my face. I’m hoping to see Amazon and either J Crew or BR in the championship. How does Topman beat Eddie Bauer for a spot? What the heck is Topman? I always want to like Eddie Bauer, but I find the way they cut most of their clothing to be a bit blocky and formless. I do have a few dress shirts of theirs that fit fine, but they are the exception. This is kind of a weird bracket. I think each store has its specialties (i.e. Indochino with custom suits). However, I would buy a Banana Suit over an Indo suit any day of the week. If you asked me which store I would buy a sub $300 suit from, then it would be different. I think it would be cool to see this bracket broken down by garment/service type. J. Crew wins out for me overall. LEC would be a more economical choice. I concur with the statement regarding the LEC hand-written note. It is nice to see a company go the extra mile with the hand-written gesture. To me, it says, we put some effort into customer service. I surprised with all of the love for LEC. I admit that I was as charmed by the handwritten note as much as everybody else but, beyond that, I have serious issues with their stuff. I think I have had some issues with almost everything that I have ordered from there. Poor build quality on some of their stuff (I bought a cotton pea coat that had loose buttons that started to fall off after one wear), wonky fit issues on others. I think LEC is worth it when they are having a kickass sale. You can really stock up on alot of stuff for cheap but I wouldn’t pay full price for anything they sell. My personal dark horse is Amazon. I have snabbed so many great things for super cheap from that site. I don’t know who prices their stuff or how but one day, something that is usually over $100 could be on sale for under $50. It is a complete crap shoot but, if I’m interested in an item, I’ll do a quick check on Amazon first. I have gotten deals from them that would make Gilt blush plus free shipping if Amazon is the actual seller. Calling J Crew vs Amazon for the final! I would appreciate some Amazon tips. I’ve only seen good deals on the rare tie or watch, which isn’t enough for me to consider them against the real contenders. Is there a secret to finding clothes on Amazon? Also, tough call on J Crew vs. 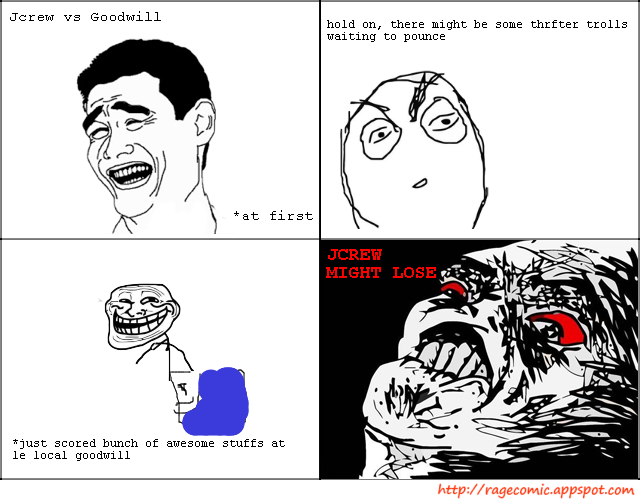 Goodwill. I’ve actually had very poor luck with Goodwill, but I thrift a sizeable amount of my wardrobe. J Crew, on the other hand, is the best (as far as I’m concerned). I wish I could see them each paired against something easier (like Nordstrom, Topman, or Endless). I also think Target should make a real play, considering its great prices. Target and Goodwill but no Kohls or JCP? Yeah real legit competition.